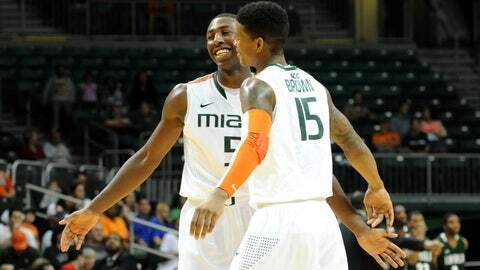 Miami Hurricanes guard Davon Reed (left) greets teammate guard Rion Brown (right) during the first half Monday night. CORAL GABLES, Fla. (AP) — Rion Brown scored 17 points to lead Miami to a 71-48 win over Loyola on Monday night. The Hurricanes never trailed and increased a 23-point lead at halftime to 60-30 on Brown’s third 3-pointer with 9:26 remaining in the second half. Brown shot 4 of 6 from behind the arc and had nine rebounds. Donnavan Kirk scored 12 points and James Kelly finished with 11 points for Miami (8-5). Tonye Jekiri was Miami’s fourth double-figure scorer with 10 points. Miami held Loyola’s Dylon Cormier, the nation’s fourth leading scorer to 11 points. Cormier entered Monday’s game averaging 24.1 points-per-game. Eric Laster scored 13 points to lead the Greyhounds (5-6). Two runs propelled the Hurricanes to 13-point leads in the first half. After Loyola reduced Miami’s first 13-point advantage to a three-point lead, the Hurricanes countered with eight straight points. Kelly’s dunk with 8:13 remaining ended the spurt and increased the Hurricanes’ lead to 24-11. Miami held Loyola scoreless for a 6:30 stretch until Franz Rassman’s tip-in with 6:40 left ended the Greyhounds’ scoring drought. Kelly’s 3-pointer with 47 seconds remaining in the first half gave the Hurricanes their first 20-point lead at 42-20. Brown converted one of two free throws with 15 seconds remaining for a 43-20 halftime lead. The Greyhounds responded from an early 13-point deficit with 10 unanswered points during a 2:40 stretch in the first half. Laster hit consecutive three pointers and Denzel Brito’s layup with 13:10 remaining capped the run and got Loyola to within 14-11. Miami opened the game with a 14-1 surge in the first 3:48 behind seven points from Brown. James Kelly also scored two baskets in the Hurricanes’ early spurt. Miami resumes ACC play Saturday at Syracuse. The Hurricanes lost against Virginia Tech Dec. 8 in their lone conference game before January. The Greyhounds open their Patriot League schedule with a home game against Navy on Thursday.